Global Environmental recently received notice from the Washing- ton State Department of Ecology that the company was entered on the list of state-approved primary oil-spill response contractors. Under newly adopted legislation codified in WAC 173-181, private contractors wishing designation on oil-spill contingency plans as the primary responder must be certified by the state. A formal evaluation of the contractor's compliance with all statutory and regulatory require- ments is initiated before approval status is granted. Global Environmental is the first company to acquire approved status from the State of Washington. O-Z/Gedney fits new and existing ullage tubes on petroleum and petrochemical product carrying vessels. 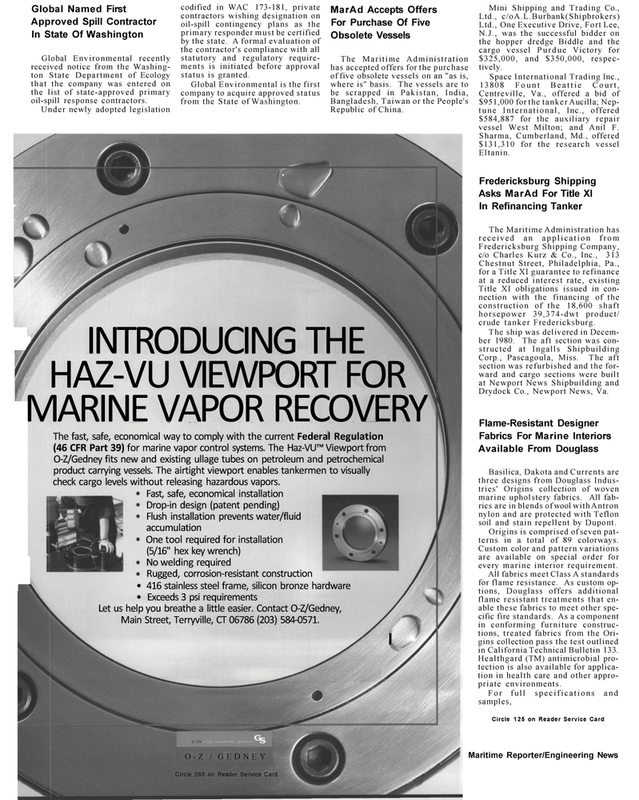 The airtight viewport enables tankermen to visually check cargo levels without releasing hazardous vapors. Main Street, Terryville, CT 06786 (203) 584-0571. N.J., was the successful bidder on the hopper dredge Biddle and the cargo vessel Purdue Victory for $325,000, and $350,000, respec- tively. Centreville, Va., offered a bid of $951,000 for the tanker Aucilla; Nep- tune International, Inc., offered $584,887 for the auxiliary repair vessel West Milton; and Anil F.
Title XI obligations issued in con- nection with the financing of the construction of the 18,600 shaft horsepower 39,374-dwt product/ crude tanker Fredericksburg. Drydock Co., Newport News, Va.
Basilica, Dakota and Currents are three designs from Douglass Indus- tries' Origins collection of woven marine upholstery fabrics. All fab- rics are in blends of wool with Antron nylon and are protected with Teflon soil and stain repellent by Dupont. Origins is comprised of seven pat- terns in a total of 89 colorways. Custom color and pattern variations are available on special order for every marine interior requirement. All fabrics meet Class A standards for flame resistance. As custom op- tions, Douglass offers additional flame resistant treatments that en- able these fabrics to meet other spe- cific fire standards. As a component in conforming furniture construc- tions, treated fabrics from the Ori- gins collection pass the test outlined in California Technical Bulletin 133. Healthgard (TM) antimicrobial pro- tection is also available for applica- tion in health care and other appro- priate environments.